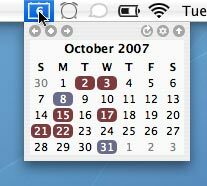 TinyCal – Google and Apple Calendar in the Mac Menubar. Easy access and view of Google or Apple Calendar, straight from the menubar. Add events, reminders, lots of options. It can show multiple months, use custom calendars, show holidays from many countries and multiple personal/business calendars. Very handy! Easy access and view of Google or Apple Calendar, straight from the menubar. Add events, reminders, lots of options. It can show multiple months, use custom calendars, show holidays from many countries and multiple personal/business calendars. TinyCal has many useful features. TinyCal requires Mac OS X 10.9 or later. Google Calendar integration is provided by the Google. 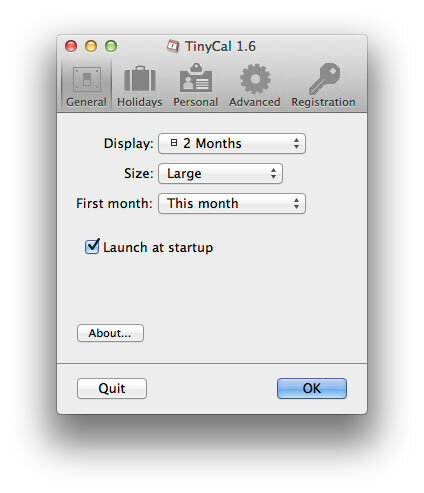 TinyCal can be customized to show 1, 2, 3 or 12 months at one time. The display can be arranged as tall or wide. 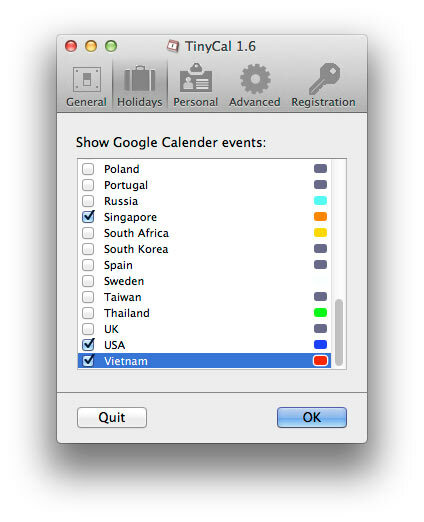 TinyCal can display public Google Calendars for holidays for 40 different countries, from Australia to Vietnam. It can also display events from your personal Google Calendar. The following screenshot shows holidays from the USA in blue and a personal calendar in red. 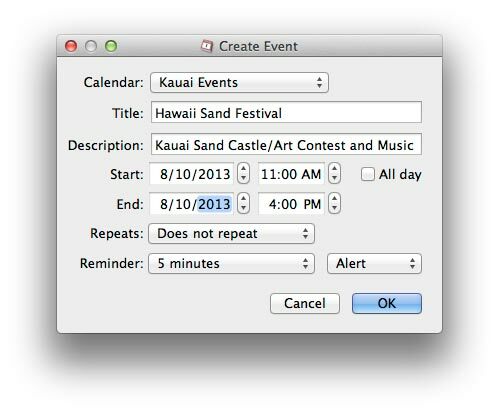 TinyCal can be customized to show other calendars, such as Buddhist, Hebrew, Islamic, and Japanese. 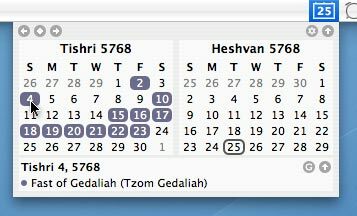 The following screenshot show the Hebrew calendar with Jewish holidays. The TinyCal window is a tear-away menu that can be repositioned anywhere on the screen. In the TinyCal window, today’s date is circled. In addition, if there are any events occurring today, they are reflected in the menubar icon. In the following screenshot, the blue triangle in the lower right indicates that there is an event today. The basic controls are illustrated in the screenshot below. Close window Close the TinyCal window. Prefs Display the preferences panel. Reload Reload events from Google personal calendars. Only available when there are enabled personal calendars. Next month Move to the next month. Today/Snapback Move to the current month, if you have moved to a different month. Snapback to prior month if you are on the current month. Previous month Move to the previous month. Google calendar Go to Google Calendar. Only available when there are enabled personal calendars. Close day detail Close the day detail display (the lower pane). To get to the general prefs (below) click the prefs (gear) icon 2nd from top right in drop down calendar. In the General preferences pane you can hit the quit button to quit the application. In the General preferences pane, you can change the number of months displayed in the Display menu. You can choose from 1, 2, 3, or 12 months, in a tall or wide configuration. Using the Size menu, the display size can be set to small, medium, or large. In the Events preferences pane, you can choose which Google Calendar events you’d like to display. To change the color of the events, click the bubble on the right. Selecting national holidays (below left) shows in the calendar (bottom right). In the trial version, you can only use one event calendar at a time, and you can not change event colors. In the Personal preferences pane, you can configure your personal Google Calendar settings. Enter your google.com username and password in the appropriate text boxes. To load or reload your calendars, use the Load button. Click on the bubble on the right to chane the color that shows in the calendar. Purchase in our store or the Mac App Store. Purchasing in our store gets you faster updates. The shareware version of TinyCal can be tried out for 30 days. After that, take your time and please consider purchasing the program. If you like TinyCal then your purchase helps push forward development to make the program even more useful. Purchasing quantities reduces the price in our store automatically. A key to remove the reminder dialog and the startup screen. The knowledge that you are participating in the evolution of TinyCal. Free upgrades throughout the year. Email Tech Support (if ever necessary). After purchasing you will use your email and a registration key to register. If you use Apple mail there is a link in the email you are sent that will register you automatically. To register manually copy and paste the info we send you into registration dialog that is found in the TinyCal Preferences. 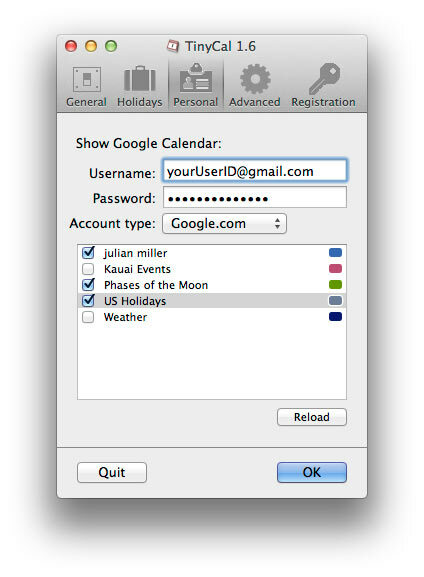 Personal Google Calendar instant access from the menubar. 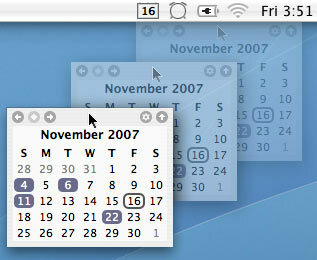 Apple Calendar instant access from the menubar. Q: Where are the preference files found? A: Both are in the Library. - fixes display of month in tinycal calendar in dark mode. - small tweak to make check for updates work and be able to set the interval of checking, daily, weekly or monthly. - check for updates (sparkle) now works. you can also set the interval. this first time you may need to manually download. - fixed the crash on choosing apple calendar. 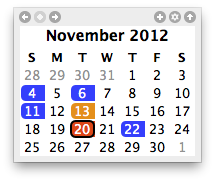 - now supports Apple Calendar! select either Apple or Google calendar in the prefs. - added extra calendars for Google Calendar. it includes national, religious, sports and misc calendars. very handy. - many more small changes and improvements. thanks to all users for your suggestions and bug fixes! it helps the evolution of the app. - compiled with latest xcode. - create event loop fixed. - versions now for shareware (in plum amazing store) and apple store (when they get the review finished).